We report the unique growth of nanofibers in silica and borosilicate glass using femtosecond laser radiation at 8 MHz repetition rate and a pulse width of 214 fs in air at atmospheric pressure. The nanofibers are grown perpendicular to the substrate surface from the molten material in laser-drilled microvias where they intertwine and bundle up above the surface. The fibers are few tens of nanometers in thickness and up to several millimeters in length. Further, it is found that at some places nanoparticles are attached to the fiber surface along its length. Nanofiber growth is explained by the process of nanojets formed in the molten liquid due to pressure gradient induced from the laser pulses and subsequently drawn into fibers by the intense plasma pressure. The attachment of nanoparticles is due to the condensation of vapor in the plasma. Micro- and nanoscale photonic devices require miniaturized glass-based photonic components. In this context, silica nanofibers have a great potential as low-loss waveguides for nano-optics and microphotonics applications. The large tensile strength of these fibers allows for the development of micro- and nanomechanical springs and levers . Nanofibers can also be used as reinforcement for the fabrication of dental composites. 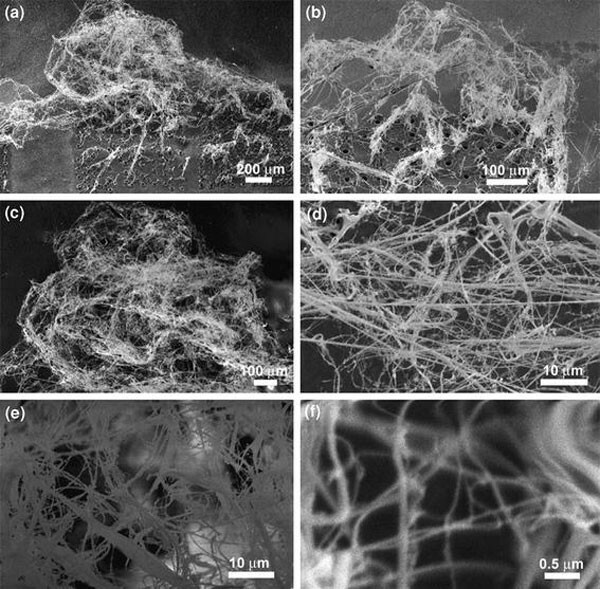 Various techniques have been proposed for the fabrication of nanofibers, such as high-temperature taper-drawing  and electrospinning [3, 4]. Recent investigations suggested that femtosecond lasers are well suited for nanostructuring of materials [5, 6]. This is due to the fact that femtosecond laser pulses do not interact with the ejected particles, thus avoiding complicated secondary laser-material interactions. Further, the material reaches extreme temperature and pressure and cools down in a very short time. This leads to material states which cannot be produced using longer pulses of comparable energy. The fast cooling also results in minimal heat accumulation and small heat affected zone. Although previous investigations on femtosecond laser nanostructuring of materials showed the formation of silicon nanotips , nanobumps in thin gold films , thin rims in borosilicate glass [9, 10] and nanofibers in chalcogenide glass  using femtosecond laser radiation with kHz repetition rate, the growth of glass nanofibers at MHz repetition rate under ambient condition has not been reported. In a previous study, we report the synthesis of weblike nanoparticles aggregate of silicon and metallic materials using MHz frequency femtosecond laser radiation under ambient condition  and is explained by the theory of vapor condensation. In the present work, we aim to study the unique growth of nanofibers of silica and borosilicate glass using femtosecond laser radiation at MHz repetition rate under ambient condition, which is defined by rather a different mechanism. We intend to discuss the growth mechanisms of the nanofibers. A direct-diode pumped Yb-doped fiber amplified ultrafast laser system (λ = 1,030 nm) capable of delivering a maximum output power of 15 W average power at a pulse repletion rate ranging from 200 kHz to 26 MHz is employed in this experiment. In the present case, arrays of microvias were drilled on silica and borosilicate glass specimens using laser radiation with a repetition of 8 MHz and pulse width 214 fs. 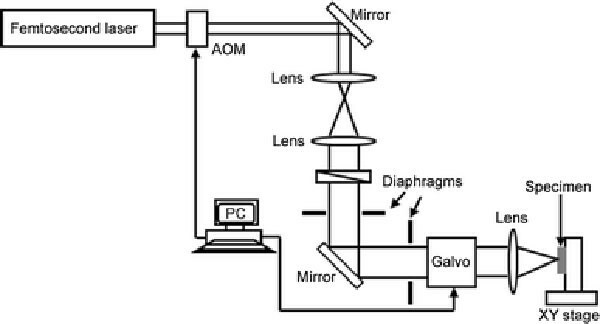 The experimental setup used is presented in Fig. 1. The laser beam is focused on the substrate surface and scanned using a computer controlled galvanometer system. The specimens are processed with and without nitrogen background gas at atmospheric pressure. SEM micrographs of nanofibers generated in borosilicate and silica glass materials using femtosecond laser radiation at a pulse frequency of 8 MHz and pulse width 214 fs are presented in Figs. 2and3, respectively. 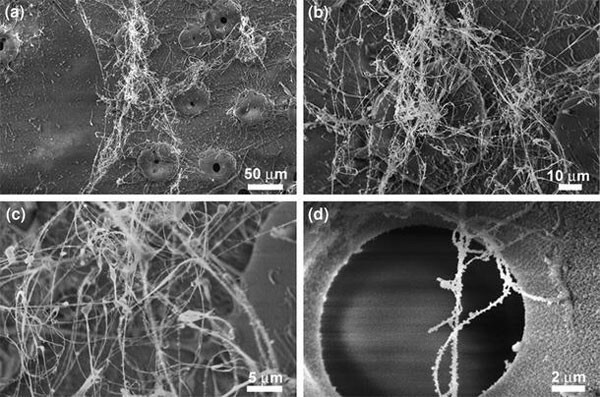 It appeared from SEM observations that nanofibers are grown both parallel and perpendicular to the substrate surface from the molten material in laser drilled microvias. Fibers grown perpendicular to the substrate are intertwined and bundle up above the surface (Figs. 2b, c,3a–c), while fibers grown parallel to the surface are attached to the substrate (Fig. 2a). The nanofibers are of a thickness of few tens of nanometers (Figs. 2d,3f) and length up to several millimeters. The SEM images in Figs. 2d and3e revealed the attachment of nanoparticles at some places on fiber surface. Processing of dielectric materials for example glass using femtosecond laser radiation involves steps such as nonlinear absorption, plasma formation, shock wave propagation, melt propagation, and resolidification. Laser radiation energy is absorbed by the electrons in materials through multiphoton and avalanche ionization and then transferred to the lattice within few picoseconds, after which heat diffusion into material begins . At the same time, the ionized material is removed from the surface through ablation in the form of an expanding high pressure plasma. A smaller portion of the absorbed energy from laser radiation remains in the material as thermal energy. Since glass does not have a latent heat of melting, all of this energy is used for melting. The melt time and the pulse repetition rate have significant influence on the growth of nanofibers. The lifetime of the molten material is determined by the time in which the energy diffuses into the substrate. The estimated melt time based on one-dimensional heat conduction model for glass varies between 0.4 and 0.8 μs , which is longer than the pulse separation time of 0.125 μs used in the present experiment. As a result, resolidification of molten material throughout the irradiation process is avoided. This helps for the continuous growth of the nanofibers with successive laser pulses. Furthermore at 2 MHz, the pulse separation time is 0.5 μs, which is longer than the melt time, only resolidified particles are observed on the irradiated surface. The forces acting on the molten material are interacting capillary forces coupled with thermal processes (Marangoni force) [8, 12] and hydrodynamic forces exerted by the plasma above the surface . The temperature gradient on the molten surface, which follows the Gaussian intensity profile of the laser beam induces the thermocapillary flow . The temperature gradient in turn creates surface tension gradient that drives material from the hot center to the cold periphery. This behavior is expected in most materials where the surface tension decreases as the fluid gets hotter in the center . However, with glass the surface tension gradient is positive, and as a result the thermocapillary flow would actually drive fluid from the cold periphery to the hot center . This is in contrast to the one observed in our experiments where the nanofibers are grown along and perpendicular to the substrate surface. By taking into account of the pressure gradient created by ablation plume, the fiber growth can be explained as follows. The strong temperature gradients produced by the tightly focused femtosecond laser pulses generate acceleration of the molten liquid at the melt/air interface. This acceleration as well as the plasma plume induces a pressure gradient from the center toward the periphery in the molten liquid of the laser-drilled microvias. The highly energetic droplets that are formed inside the molten material are moved to the exterior of the laser-drilled microvias due to pressure gradient in the molten liquid and provide the heads of nanojets which eventually draws the fiber from the melt and because of shorter duration of the laser pulse the fibers drawn are immediately solidified. Further, subsequent laser pulses are not interacting with the nanofibers that are grown perpendicular to the surface. This argument is supported by the calculated timescale for Marangoni flow in glass which is three orders of magnitude longer than the pressure driven flow . Therefore, Marangoni effect is not playing a significant role in the formation of these nanofibers for the conditions used in the experiment. Hence, the large plasma pressure above the molten surface acts to move the fluid more quickly than do the surface tension gradients. Further, it is observed that the use of nitrogen background gas at atmospheric pressure suppresses the fiber growth. With nitrogen background gas the plume expansion will be slowed down due to collisions between vapor species and the gas atoms . Moreover, condensation of vapor present in the plasma leads to nanoparticles generation [5, 16]. The temperature of these nanoparticles is high enough to attach with the fibers. Hence, condensation is not playing a significant role in nanofiber generation. Since the repetition rate is in MHz range, laser dwell time (interaction time) also plays a role in nanofiber growth. For a dwell time of 0.1 ms, the laser radiation is not making any change in the surface. For 0.5 ms, nanoparticles aggregate are generated and fiber growth is not observed. Fiber formation is observed at a dwell time of 1 ms. The melting threshold reached within few microseconds of irradiation and thereafter the melt is maintained by the subsequent laser pulses. EDX analysis of the nanofibers shows that there is no significant change in composition when compared to the untreated glass surfaces. 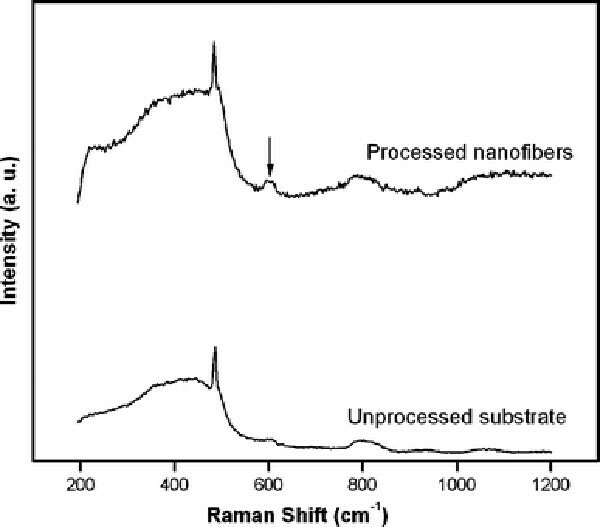 Microraman spectra of the unprocessed substrate and processed nanofibers of silica glass are presented in Fig. 4. The intensity of the spectrum of nanofibers in laser-irradiated surfaces is much higher than the untreated surface. Moreover, a slight increase in intensity at 603 cm−1 peak is observed in the spectrum of nanofibers. The Raman peaks at 487 and 603 cm−1 are due to breathing modes from 4- to 3-membered ring structures in the silica network . The increase in intensity corresponds to an increase in relative number of these ring structures in the glass network. Similar changes are observed for silica subjected to femtosecond laser treatment . In summary, we report a characteristic growth of nanofibers of silica and borosilicate glass using femtosecond laser radiation at 8 MHz repetition rate and a pulse width of 214 fs under atmospheric pressure. The fibers are grown perpendicular to the substrate, intertwined and stands above the surface. The nanofiber growth is explained by the formation of nanojets in the molten material and drawn into fibers by high plasma pressure. Further studies are required to find the suitability of these nanofibers as waveguides for nanophotonic applications. This research is funded by Natural Science and Engineering Research Council of Canada.